The other day was a trip I’ll never forget in my life and an eye-opening experience as I’ve been shifting into making Arizona and the desert feel like home. A couple of my girlfriends and I decided to camp, randomly, on a Wednesday night. For the past months, I’ve been feeling adventurous and thinking that maybe I haven’t done everything there is to do out here in the desert. Camping is one of those things that I have always had in my mind but I never took the full opportunity to experience it before. 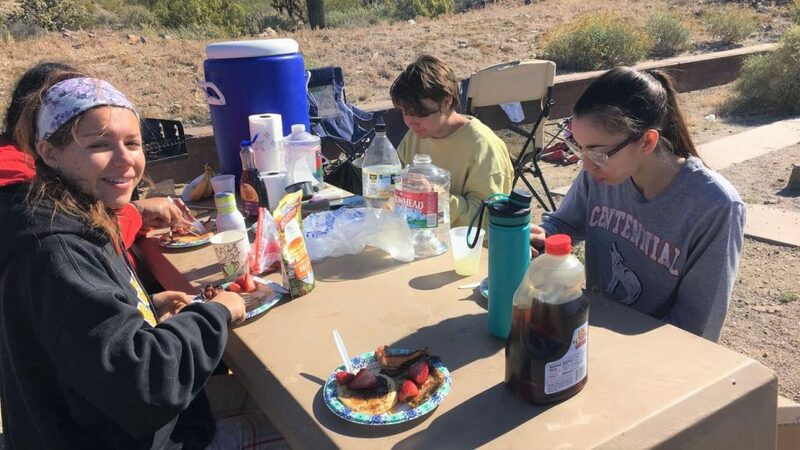 For one, my family and I are not big outdoorsy people (I’m slowly getting into it as a lover of hiking though), so you’d never see me experience camping with my parents. When I first came to Arizona, I did not have friends in the beginning or even knew that many people besides my family. 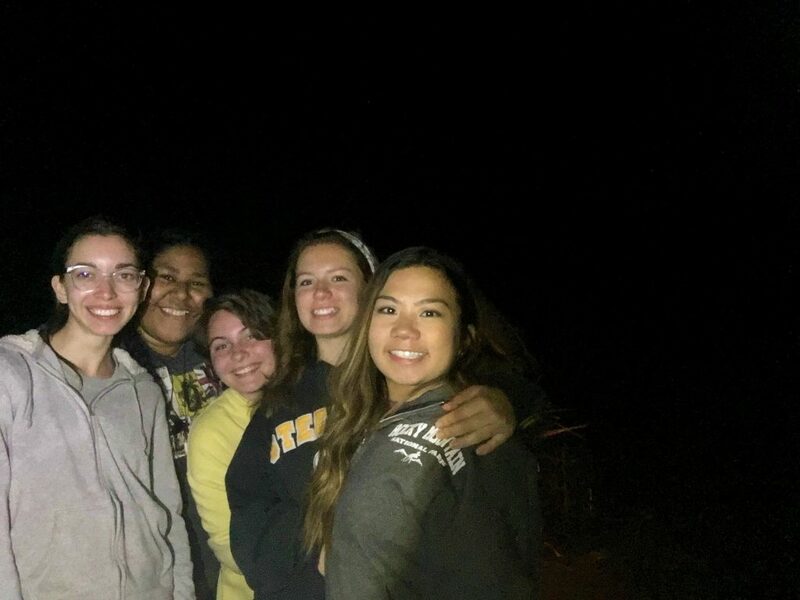 However, for the last few months, I’ve been willing to put myself out there to meet people and creating friendships that will be full of fun memories to remember in a lifetime. I’ve come to realize that you may not feel like you’ve fully created a positive life and make a state your home if you don’t at least find purpose out there. 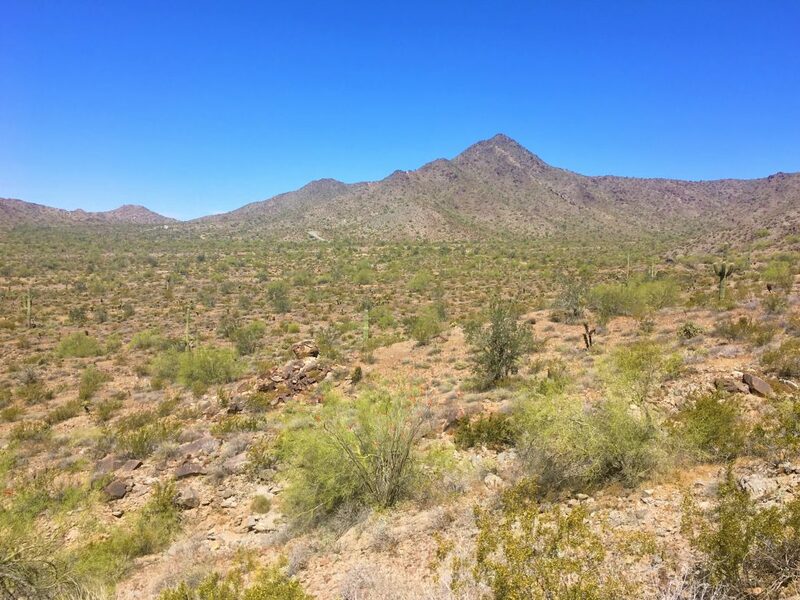 One of my main purposes in living out here in Arizona is to connect with those who share one of my biggest passions: adventure. I cherish human connections and adventure is a great way for people to bond together. 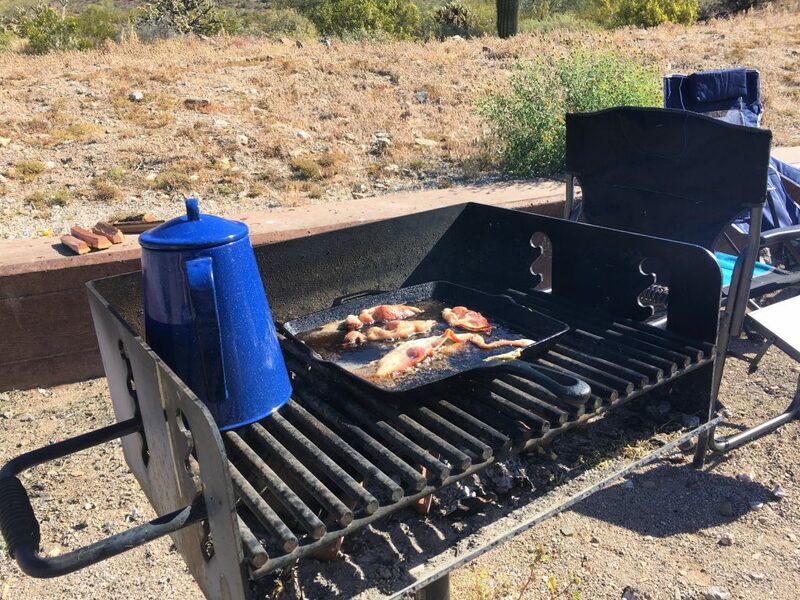 During this camping trip, it hit me that I can envision Arizona as home, after several months struggling to come to terms that I am out here and not on the east. My heart is still tied to the east coast, but this does not mean I should push away all of the gratitude and changes coming my way living in a state I’ve always admired. Practicing the law of attraction has been working in its favor, after many self-conflict battles with myself from the end of 2018 and the beginning of 2019, and taking a break from dwelling on the hard challenges of life has given me more of a peace of mind. I manifest the positive changes I crave to build a life around my new home and more of the adventures I want to take. 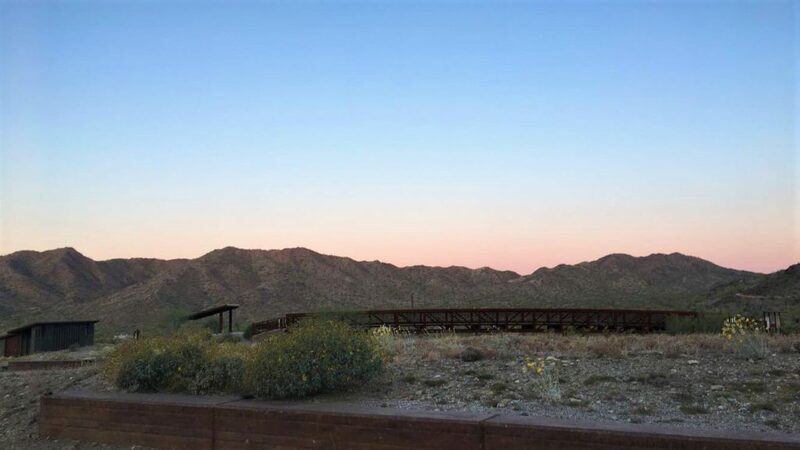 Sunrise at Skyline Regional Park — the views when we first woke up. 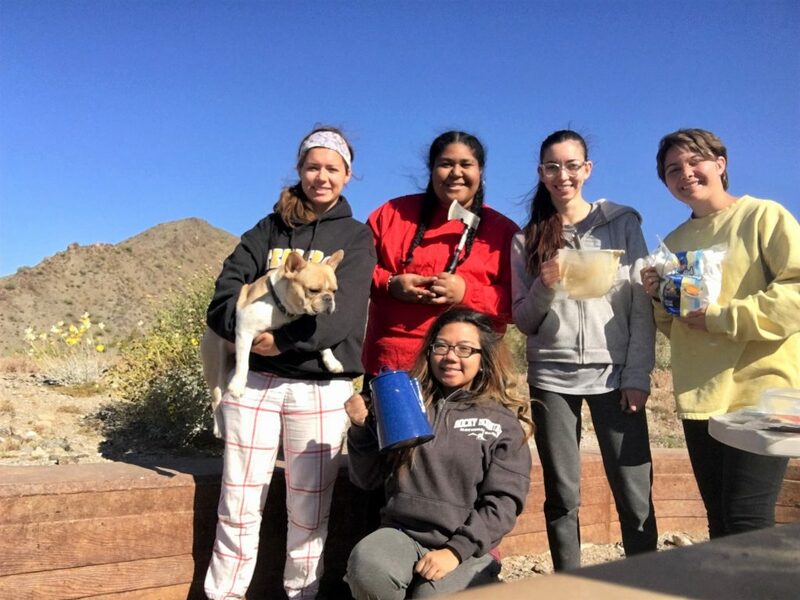 My girls and I set up a campsite at Skyline Regional Park, a park full of miles of trails for hikers and bikers located in Buckeye, Arizona. Almost half an hour from my home in Surprise, Arizona. Camping here wouldn’t give you the full experience of having “to be one with nature” completely since there’s access to a public bathroom and the campsite consisted of a grill, picnic table, and a fire pit. It’s a nice place to camp in if you’re just beginning with camping. Some daring moves to sleep without a tent but stargazing out here at night was an amazing experience. I didn’t arrive at the time when my other friends were setting up the tent but I was told that the tent couldn’t be put up due to the ground not being strong enough to hold the stakes. There was an idea we all agreed to, but I don’t highly recommend… We would have the tarp placed on the ground and sleep in our sleeping bags on top of it. 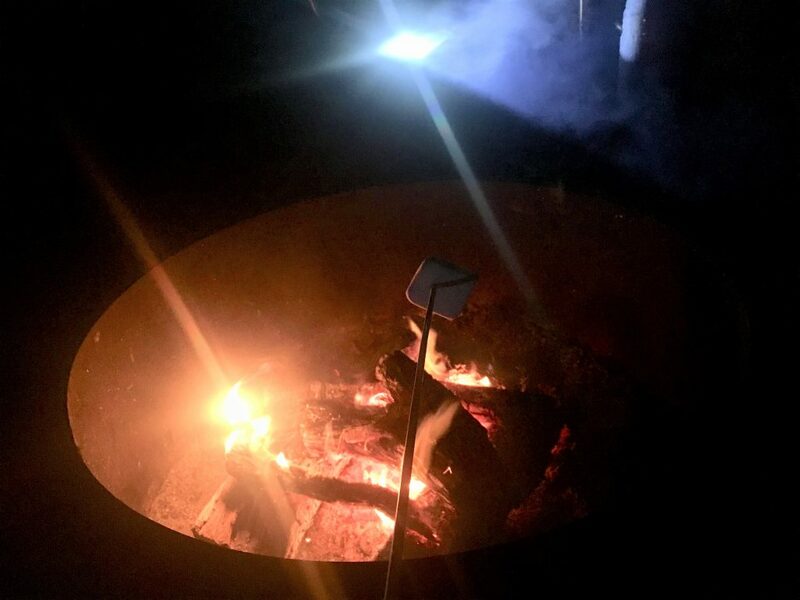 I was quite hesitant of the idea because of the possible things that can come out at night: bugs like spiders and scorpions active at night, mountain lions (luckily, there should be none in this area as I heard), and just laying out in the open outside was something I’ve never done. A group selfie of us taken by a timer on my phone! As far as it was the smartest idea to do, I’m not really sure about that… but it was the best way to do some serious stargazing, something I’ve always wanted to in the midst of the night in the desert. It’s so peaceful to witness the infinite stars that are brightly visible in Arizona’s skies and to see the silhouette of mountains and cacti through the night and falling asleep to the whole scenery. This was my first time camping in the beautiful wild desert, and I was so stoked. Just imagine being able to have that quiet time to yourself tucked into your sleeping bag and just watch the stars above you, instead of the old school days where I took trips to the planetarium to imagine the stars above me to learn about the constellations and the magical feeling of sitting under there, wondering when will me staring at these stars controlled by a planetarium projector be the real thing? Back in New Jersey, seeing bright and visible stars are hard to come by and are often hidden by smog, fog, and its clouds. It wasn’t all that beautiful though during our camping adventure. It took us a couple of times to get the fire started and a couple of hands to work together to make it go. 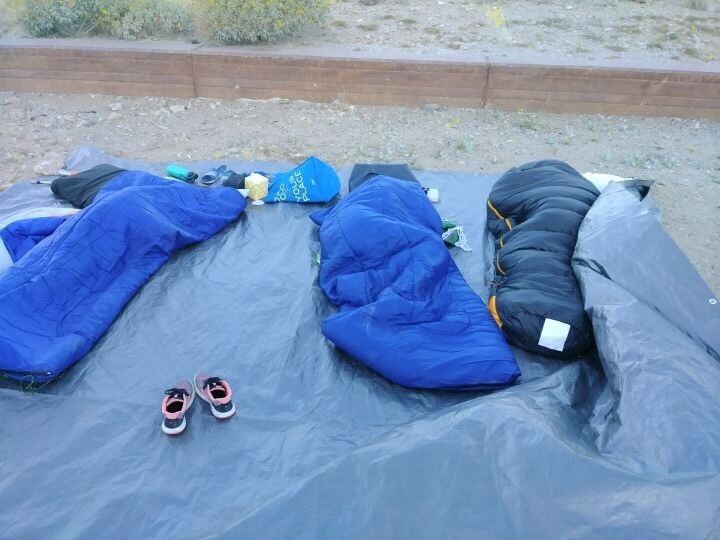 We had to deal with the powerful, cold wind (it was a windy day and night for the past two days in the West Valley) that rushed into the middle of the night and into the morning that made sleeping uncomfortable and had us risk becoming prone to sickness. That’s what you get when you choose to sleep in the open under the stars and the desert is full of contradictions, from being blazing hot during the day to even cooler at night. To my mistake and poor judgment, I was not covered in many layers of my clothes. I also bought my Mexican blanket, which is one of the warmest blankets you’ll probably ever invest in, but it did not give me the full warmth I craved. Cooking up some dinner! Maybe even some breakfast for dinner, hence the bacon. 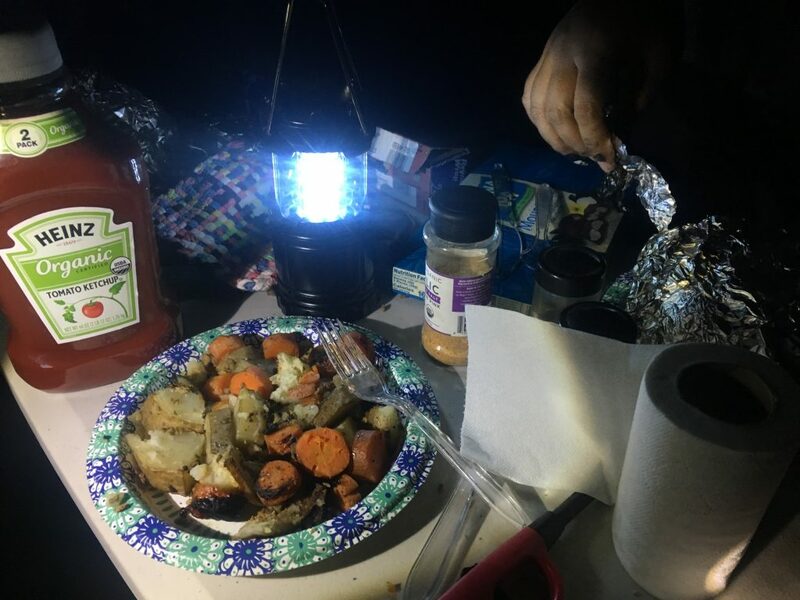 At night when we had our bonfire set up, we roasted s’mores, cooked potatoes, and cooked a meal of potatoes, carrots, onions, and meat. By the next morning, we made paleo pancakes (they’re so good and healthy for you!) that we topped with strawberries and syrup and we made bacon too. Having our breakfast, family style. 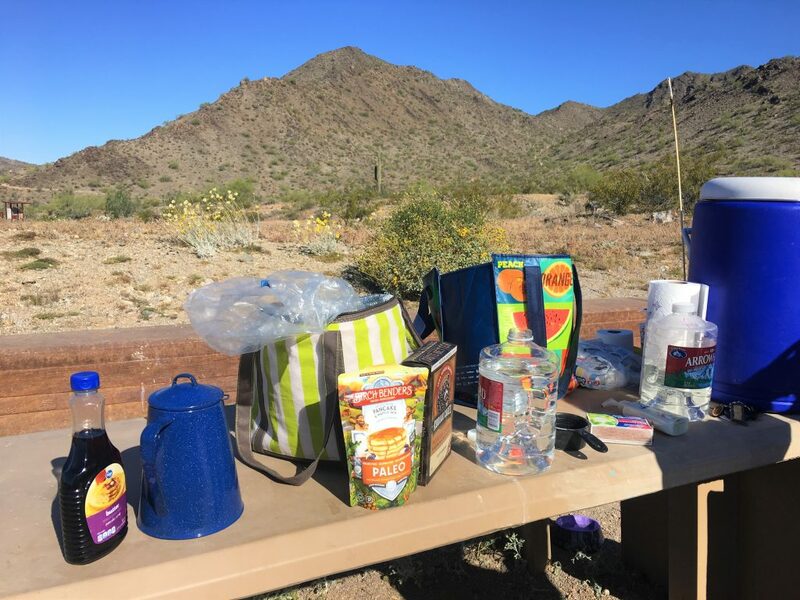 On the next morning after we ate breakfast, we packed up all our stuff to go and got ready to go for a hike, the same trail that I just did a few days prior but I couldn’t complete it to the top because of my experience of heat exhaustion on the trail (you can read my story here). Halfway through the trail, we didn’t get to complete it (once again for me) because out of nowhere, we heard a rattlesnake and saw it right before our eyes, with its tongue out, in the middle of the trail. It was crazy especially since I’ve never had a close encounter with one before!! It also blended pretty well with the color of the ground, but we ran away when we saw it and warned the incoming hikers that were hiking the trail too. We all just woke up! 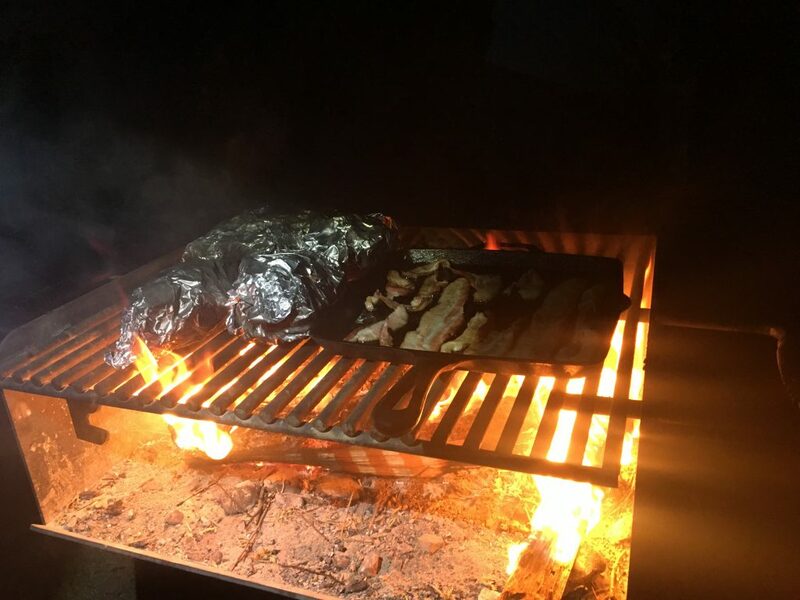 But we all loved contributing to cooking and camping. Do plenty of research and read all the campsite rules. Make sure the campsite you choose will have amenities that will serve convenience to you, especially if you’re just a beginner camper. Make sure to understand all the rules of the campsite to avoid trouble from the park and to keep a safe environment for you and other campers around. Look up what the weather will be like the day you go camping and ask any park rangers if there are any important conditions to look out for. Make sure to research what the environment will look like, its features, and what type of danger to be aware of when accessing the campsite and the surrounding whole area. Knowing the dangers includes understanding what type of animals and venomous insects are present in the area, especially which ones will be wandering at night. Make sure to bring layers and sweaters for the night. As I mentioned in my trip, it got cold during the night and the wind that was happening during the day became more extreme and colder. 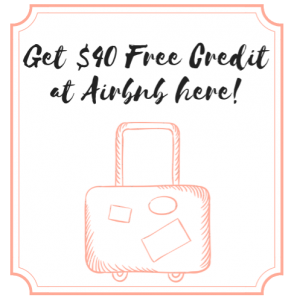 Bring extra things such as heavy blankets to feel extra warm and cozy. Don’t forget your flashlights and portable chargers! This will always be a camping given rule but bring a large powerful flashlight or two. It will be very dark at night and instead of opting for your phone where you can drain the battery quicker, a flashlight will be your best friend at night. It’ll help you navigate your way when you have to find the bathroom. However, bring a portable charger so you can keep your cellphone charging to be used anytime for emergencies. Bring plenty of water. You should never attempt to do outdoors activities of some sort without carrying a good amount of water to always keep hydrated. A cooler to bring along during camping with water you can refrigerate in is the best thing to do. Learn about the signs of heat exhaustion, heat stroke, and dehydration. 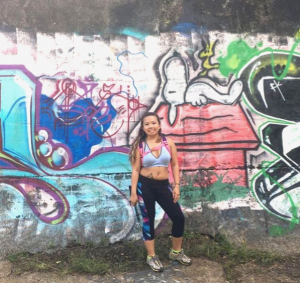 These heat-related illnesses can occur suddenly and with little to no warning, you can read my story here where I recently dealt with symptoms of heat exhaustion. If you’re more knowledgable about the signs and symptoms early on, you can prevent it from affecting you worst or from happening. Understand the midday is the worst time to be outside, rest during this time and find shade. It can get extremely hot during the middle of the day and it can be dangerous and cause heat-related illnesses. It’s recommended that you find shade to rest during this time and not attempt to do more outdoor activities during this time. Make sure to tell trusted people where you will be camping at and when, even when you’re with a group. It’s important to let others know about your whereabouts, even if you’re with a group already. These trusted people that you can notify can be one of your first contacts of any emergencies besides 911. Try to stay away from the areas that dangerous desert animals hide in and always shake your shoes. Remember, most snakes like to hide by rocks and scorpions and spiders love to crawl out during the night. Make sure to always shake your shoes before putting them back on if you plan to leave them outside because these insects can hide in them. Bring these important tools: a map, compass, and GPS device. They are important to have in locating a trail because trails can be tricky to the eyes and overall, not easy to find. Use your judgment to the best to your ability and listen to your gut feeling. This is a rule I carry with me whenever I am outside. If something inside you just doesn’t feel right, don’t try it and avoid it.